When I was done working today, I headed out to get an oil change and my car’s battery checked since the warning light popped on this week. I knew I’d be spending the $16.80 advertised for an oil change, but I walked out of Just Brakes $209 poorer. I needed a new battery and two different air filters in addition to the oil change. Ouch. I told Sadie that between my car issues and her vet bill yesterday, her chicken jerky budget is looking pretty bleak at the moment. I said “no thanks” to some of the other recommended maintenance services since they weren’t critical. I shall return for new brake pads in the future, Just Brakes. I’ve come to learn that a simple trip to the garage is never simple. I stuck to reading blogs on my phone and kicked myself for not bringing my book with me. Once I arrived back home, it was dinner time. 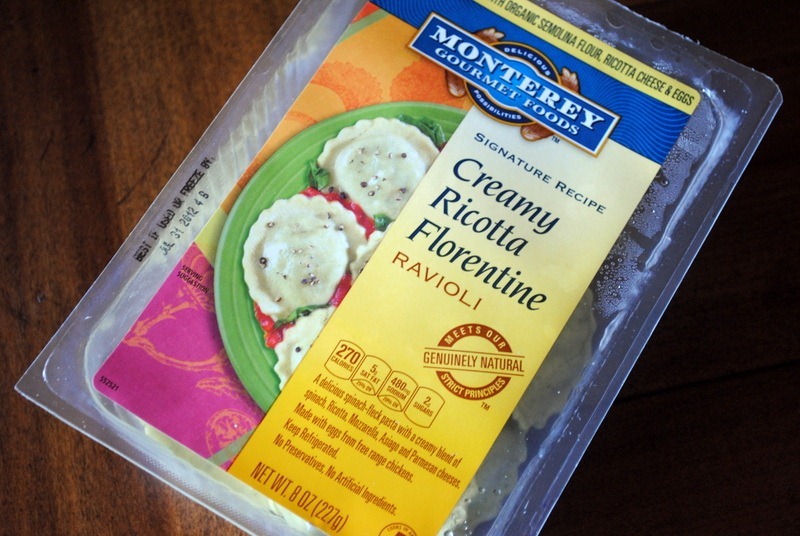 Big thanks to the kind people at Monterey Gourmet Foods for sending me some of their ravioli and pesto sauce to try! I already knew I was a huge fan of their ravioli from the countless packages Ryan and I have purchased in the past, and Ryan and I used their pesto sauce on top of triggerfish last week, so I had a feeling that tonight’s dinner would be a hit. 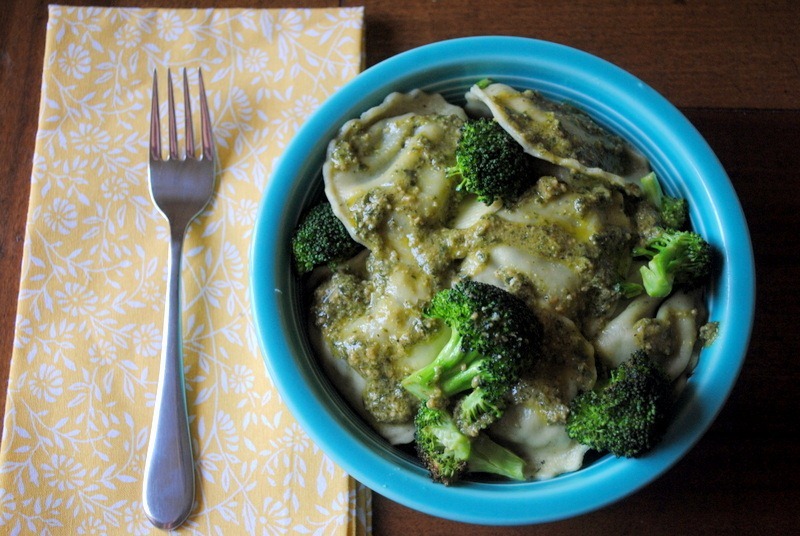 I topped ravioli and roasted broccoli with the pesto sauce and this dinner was a home run. So much flavor! It was a lean, mean bowl of green! 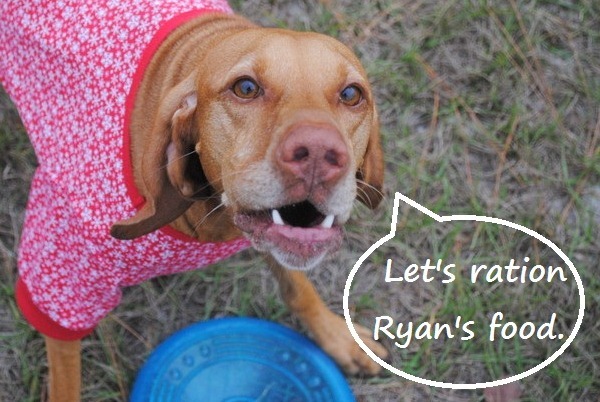 Tonight Ryan and I are hoping to watch So You Think You Can Dance. We didn’t realize the season started several weeks ago and as big-time fans of the show, I’m excited that it’s back on the air. yum! That looks so good! Pesto is tasty! I sometimes like to dip carrots in Pesto and consider it a good dipping sauce. They talked you into air filters and a new battery when you were able to start your car to get there, but you skipped other things that “weren’t critical”? Giiiirl, they saw you coming. Next time, go with a guy so they don’t try to pull that stuff…. Yummy! 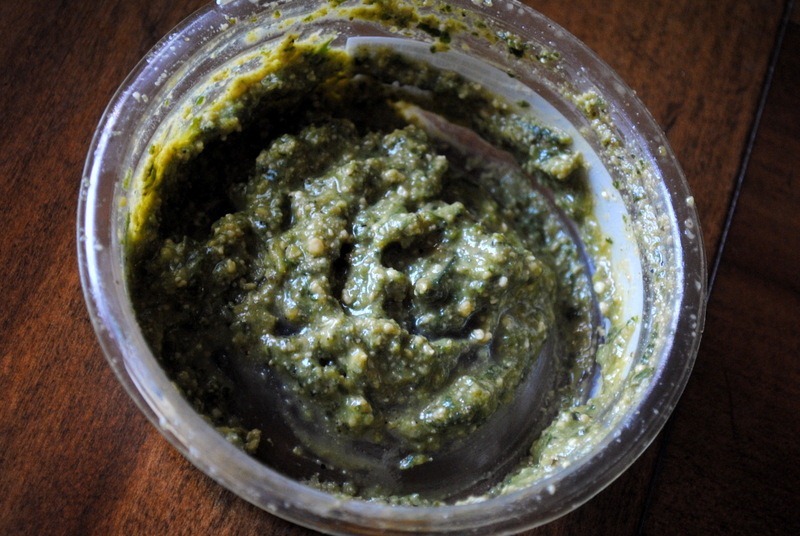 I love pesto too! Wish I could get my husband to watch So You Think You Can Dance with me… sadly, he hates it. Boo. I’m so envious of those dancers and their gorgeous muscular legs… wish mine looked like that! We love SYTYCD too! I don’t like the audition episodes though, so I wait until they pick the top ones and then start watching. I have to get an oil change this week, too. Fingers crossed that everything else looks OK on my car!! Man those places always get you for other things that are wrong with your vehicle! That picture of sadie is seriously adorable and funny! I love SYTYCD! There still in the audition rounds though so you haven’t missed much yet! It’s the one show I never miss an episode! haha I certainly can’t dance! My least favorite thing on the planet is spending money on getting car fixed! I swear every time I get an oil change there is always something more. 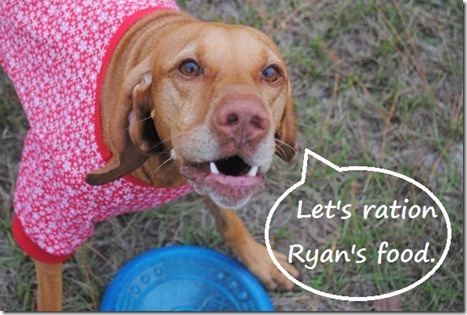 Of all the things I love about your blog, I have to say, I think the photos of Sadie w/the thought bubbles are my favorite! They always make me laugh, and this one almost made me shoot my Oreo Sonic Blast, um, I mean, my “super healthy Spinach Smoothie”, out my nose. I danced for 16 years growing up but can you believe I’ve maybe seen only one episode of SYTYCD?! Enjoy your evening! I’ve learned to say ‘No’ anytime I take my car in for just an oil change. I figured my car got me there, the lube guy isn’t a mechanic and nothing is life or death in that moment, because what if I had decided last minute to postpone the oil change until the next week! That’s how companies make their money – on the other “issues”, not the oil changes. I remember what they tell me, then go home to my husband and tell him. Most of the time, filters can be washed or blown out yourself. I hate doing anything car-related. It’s up there with laundry and appliance shopping. Thankfully, I have a husband who is pretty handy with the car. Most filters and such can be changed out pretty easily and a battery can be replaced for FREE at most auto parts stores. When I say free, I mean they will test it for you and change it if a new one is needed. You would still have to pay for the battery though. But I feel like most places try to “upsale” you when you take your car in for maintenance. I love pesto but for some reason it gives me the worst heartburn so I probably won’t be trying this stuff out. Bummer. 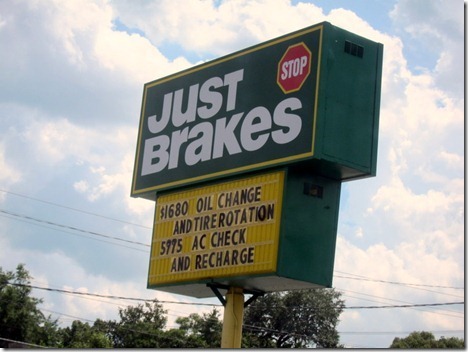 Yikes — avoid Just Brakes if you can!!! I went to one here in Orlando (unknowingly naive) and they totally ripped me off. Just had my brake pads replaced in our Honda and it cost HALF as much. If you can- try to find a local person. There HAS to be some honest, mechanic peeps in Ocala. Family owned is usually best. I agree! 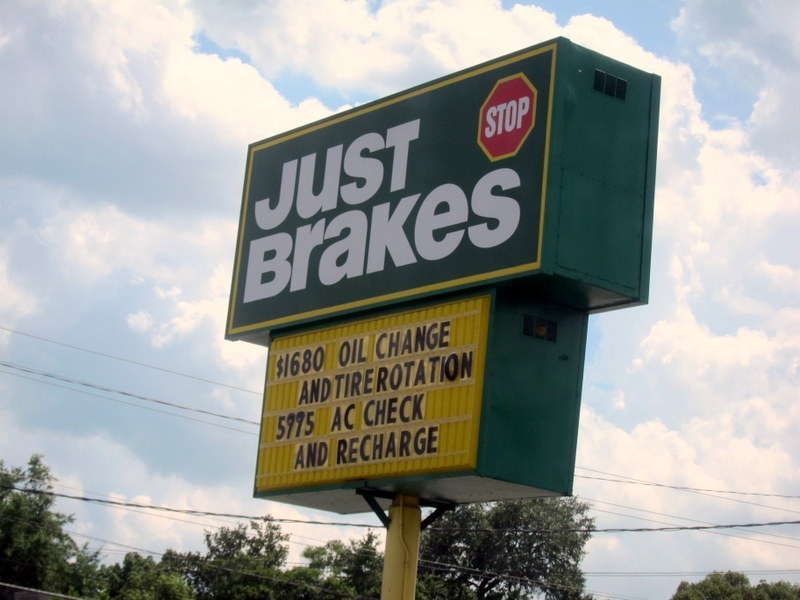 Just Brakes is one of the worst “mechanic” shops out there! Not only are they a rip-off, they do shoddy work. That’s why I love our small-town mechanic! He charges half of what any big-name place would AND let’s us know what is actually necessary and what the money-grubbing places would tell us is essential. They tend to target women especially! I’ve never watched So You Think You Can Dance, but a friend of my sister’s from Oviedo is on it! She was on it last week and it was so cool seeing someone we knew on TV! I’ll definitely be staying tuned from now on. We are battery twinsies today. I took my car in for an oil change too…came out with a new battery, a new filter, and had to have my fuel injection flushed because my car was hestiating before it started. Though, I spent double what you did. So I’m thinking the booze budget is going to take a hit this weekend. That or the bunny carrot budget. nooooo. not bunny carrot budget! 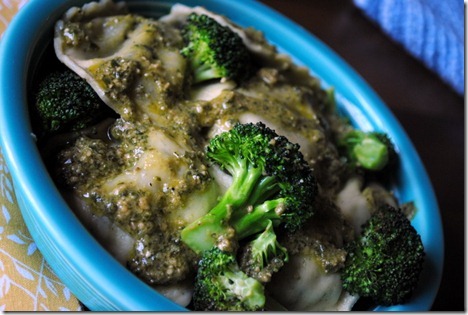 love love love ravioli with pesto & broccoli!! definitely doing this in the future! 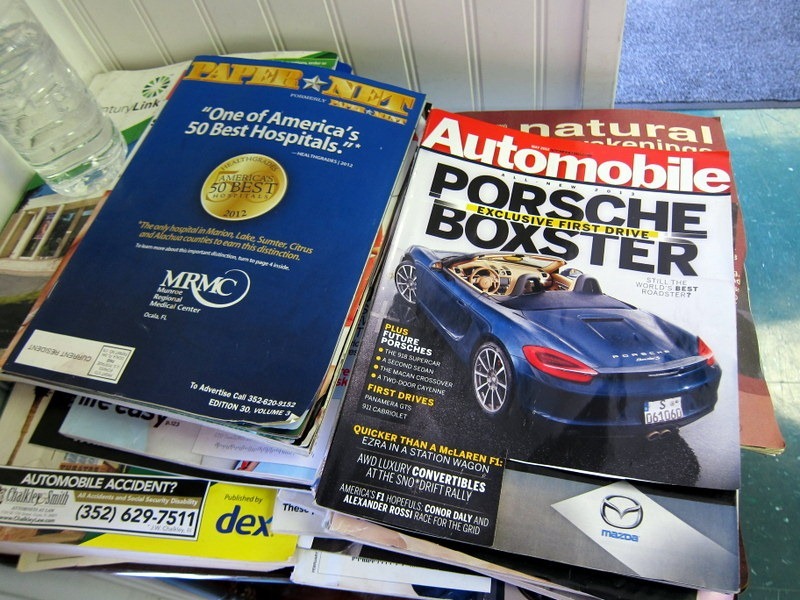 Hahaha love that reading material at the oil change place! I hate when I forget a book on days like that too, at least you had your phone! I hate going to the mechanic by myself! I always feel like they can just smell my naivety the second I walk through the door and always try and convince me to fix things that don’t need fixing. That pesto sauce looks really good. I much prefer pesto to tomato sauce! I hate taking my car in just because I know there ill always been things that can be done and it adds up! haha – we’ve had a similar day. I took my car in for an oil change and tire rotation…walked out $566 poorer (in defense of the mechanics, I suspected I was going to need the new tires, and was suspicious of a need for a tire alignment, too). Lame. I have learned to take my Nook with my everywhere. You never know when you’ll be stuck somewhere without quality reading material! It’s okay- you haven’t missed much on SYTYCD. Just the auditions. Next week starts Vegas. So excited because there’s so much great talent this year!! i can’t wait for vegas! That dinner looks simple and awesome! Be sure that the chicken jerky you’re buying for Sadie is NOT made in China!!! That reminds me, I need to have the timing belt looked at on my Kia. Those things cost around $122 JUST for the belt! *sigh* Can’t wait until we can beam places, like on Star Trek. I hate taking my car to the shop. It always makes me super nervous. My father has been a mechanic for 40 years, has been called in by the FBI to work on cases involving cars, is known up and down the northern east coadt, and is currently a lead mechanic and shop foreman at a big name place up here. Mechanics, at least the decently trained and honest ones, are not out there to rip their clients off. If you go in for one repair, their job is to go over your car and see if there are any other issues. Now whether you decide to remediate those issues is at your discretion, but the definitely don’t tell you of those issues to rip you off or because you’re a girl. At my dads place, the mechanic isn’t the one that even tells what’s wrong; he relays it to the service writer the client spoke to to bring the car in. Like I said, the decent mechanics are those in the profession for the love of the machine and their mind-set is they want it working right. lol, hate to break it to you but i’d say 90% of mechanics (especially at places like just breaks) are not in it for the “love of the machine” but for the love of a paycheck. Sorry you feel that way. You must know an awful lot of them to make such a generalization. Pasta with pesto is really the best!! YUM! 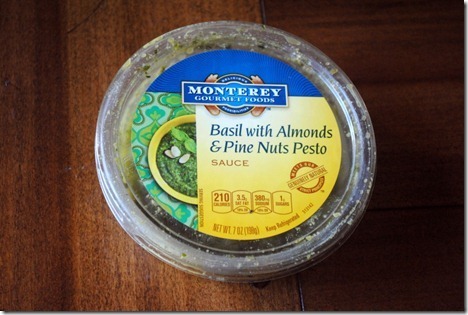 I love pesto on grilled veggies- makes a perfect side dish :)! JUST BREAKS is literally the worst place on EARTH. Do not go back there….I mean it! 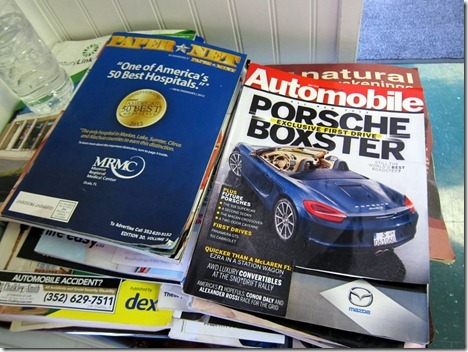 I hate the magazines at automotive places……. JUST AWFUL! Sports Illustrated is usually the best thing I can find to read. I always start new random, desperate games of Words with Friends when waiting to get my car serviced. Haha! Since I started reading about this I’ve been a bit psychotic about checking that I’m only dog products made in the U.S. PetSmart does carry some, but I’ve been visiting local smaller dog stores. They are more expensive, but I’ll pay for the peace of mind. that used to happen to me until my stepdad showed me how to change an air filter. if you can change the lint trap on the dryer you can change the air filter! good luck next time! What is the shirt Sadie is wearing? Super summer chic! 🙂 I love Sadie pics!